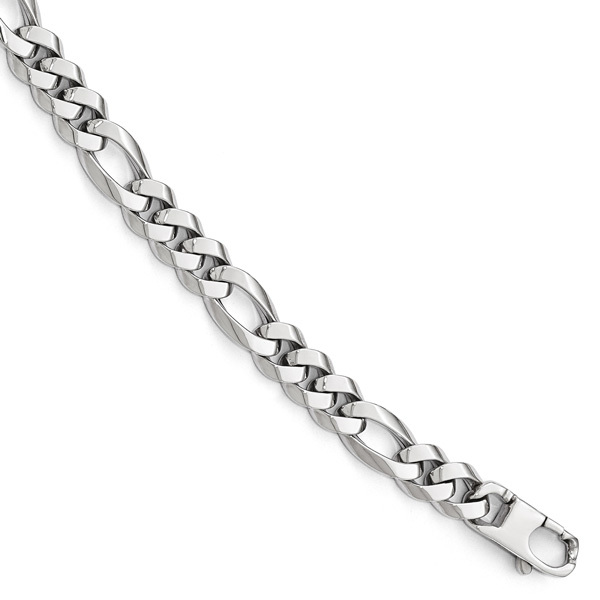 This men's 14K white gold handmade Italian Figaro bracelet from Apples of Gold Jewelry features a striking polished finish to accompany the wonderful design. The handmade bracelet, which is made in Italy, measures 8.75mm in width and 8 inches in length, and weighs approximately 12.73 grams of 14K white gold. The designer lobster claw clasp at the end of the stunning bracelet allows you to secure the bracelet on your wrist with ease. The small and long loops that make up the chain are a repeating pattern. We guarantee our Men's 14K White Gold Handmade Italian Figaro Bracelet to be high quality, authentic jewelry, as described above.